Bloomsbury Children's Books, 9781681192475, 336pp. Claire Martinson and her sister Sophie have decided to stay in Arden--the magical land they discovered by climbing up a chimney in their great-aunt's manor. 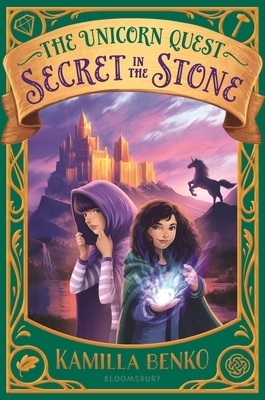 If what they've learned is true, the sisters are the last descendants of the royal family, and only a true heir of Arden--with magic in her blood--can awaken the unicorns. Since Sophie has does not have magic, the land's last hope rests on Claire. The sisters journey to Stonehaven, a famed Gemmer school high in the mountains of Arden, so Claire can train in the magic of stone. As Claire struggles through classes, Sophie uncovers dangerous secrets about the people they thought they could trust. With Arden on the brink of crumbling, can Claire prove she is the prophesied heir and unlock the magic of the unicorns before it's too late? Kamilla Benko spent most of her childhood climbing into wardrobes, trying to step through mirrors, and plotting to run away to an art museum. Now, she visits other worlds as a children's book editor. She currently lives in New York with her bookshelves, teapot, and hiking boots. In addition to the Unicorn Quest trilogy, she is the author of the original Frozen novel that bridges the events of Disney's massively successful animated movie and its upcoming sequel.